Candidates must be Juniors in high school, intending to return to school for the Senior year. Students from public, private, parochial, and home-schooling programs throughout Florida are eligible. Students must be in the top third of their class. Consideration is given to scholastic achievements, leadership, character, honesty and physical fitness. Girls are chosen by the local American Legion Auxiliary Units that work with their respective high schools through an interview process. Any student registered as a full-time student of Florida Virtual School are not eligible to apply for the program. 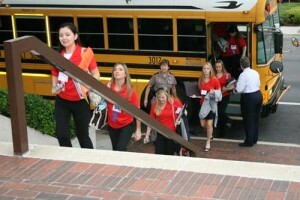 Florida Girls State is a hands-on week-long educational workshop, focusing on Americanism and the political process, sponsored by the Florida American Legion Auxiliary. The goal of the program is to help students to better understand democratic ideals and the part we as individuals play in carrying out these ideals. This program, which has been accredited as a college program to teach high school junior girls about government, politics, and Americanism. Qualified high school juniors are selected to become citizens of and participate in creating a mythical state of Seminole. This mythical state is divided into 12 cities and 6 counties and the citizens, assigned to either the Nationalist or Federalist Party, experience the two party system, much like our Government. Their rigorous schedule includes participating in political campaigns, debates, and crafting bills. As the government begins to take shape, these young women come to understand their roles in a democratic society.